On Tuesday, the International Economic Development Council (IEDC) awarded the City of Lynchburg two Excellence in Economic Development Bronze Awards for promotional projects: Lynchburg Innovation Week and “This is Lynchburg: Welcome Home” video. IEDC’s prestigious awards program recognizes the world’s best economic development marketing materials, programs and partnerships, honoring organizations and individuals for their efforts in creating positive change in urban, suburban and rural communities. Lynchburg was awarded in the population category ranging from 25,000 to 200,000. 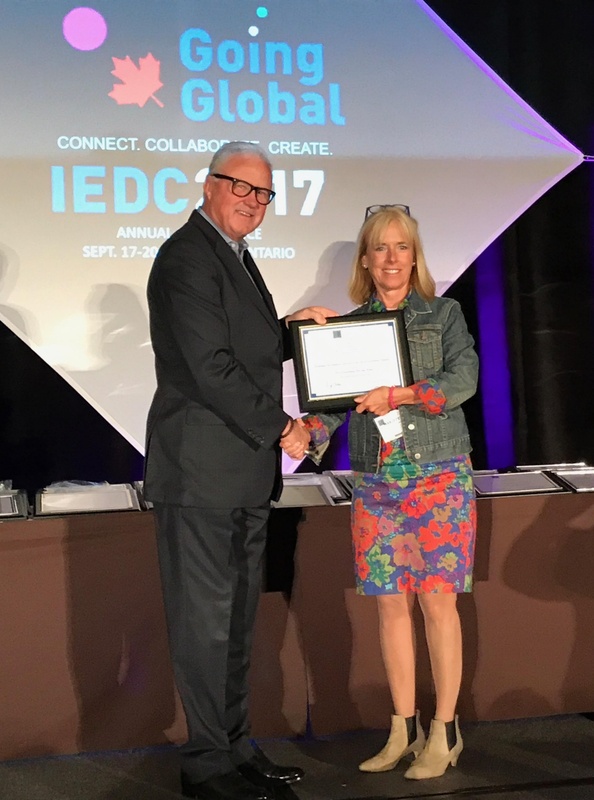 Marjette Upshur, director of economic development and tourism, accepted the awards at IEDC's Annual Conference in Toronto, ON. Promotional awards are judged on the effectiveness of the promotion, innovation/creativity, quality and completeness of information and contribution to the economic development profession. In 2015, the Opportunity Lynchburg website and digital marketing strategy won IEDC's Silver Medal for General Website, which recognizes the best communities using the web as an effective marketing tool to promote services and other information to their audiences. 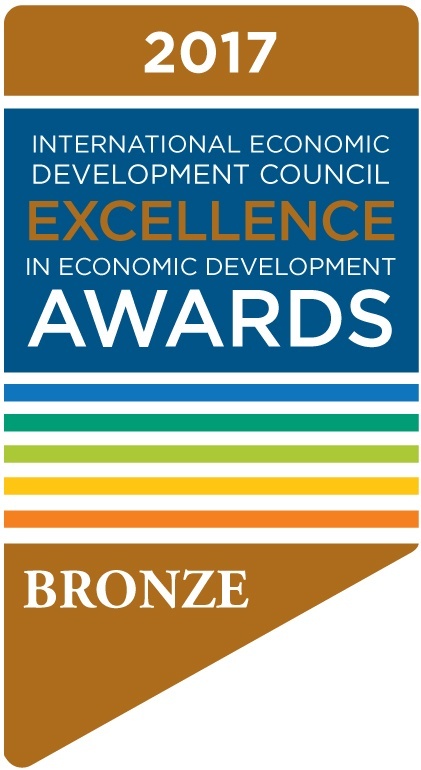 “On behalf of the IEDC board of directors and Excellence in Economic Development Awards Advisory Committee, congratulations to the Economic Development Authority of the City of Lynchburg, Virginia. Not only did they work to provide a necessary service to their community; but also, their participation in the awards program sheds light on their stellar projects which other communities can now use as a benchmark,” said IEDC board chair Michael Langley, CEO of the Greater Minneapolis-St. Paul Partnership. On June 2-4, 2016, hundreds of Lynchburg business professionals gathered in Downtown Lynchburg at Riverviews Artspace, a gallery and studio space for established and emerging artists, to celebrate the City's first Lynchburg Innovation Week. The three-day event featured a wide range of learning and networking opportunities to enhance and celebrate new strategies for economic development. Lynchburg Innovation Week opened with Lynchburg’s first Pitch Night for graduates of CO.STARTERS, a nine-week entrepreneurial training program. After pitching their business concepts, five local startups received Community Business Launch Grants valuing $40,000 and four winners opened storefront businesses in Lynchburg’s Enterprise Zone within five months of receiving startup funding. Lynchburg Innovation Week was also awarded the Community Economic Development Award (CEDA) from the Virginia Economic Developers Association and the Southeastern Economic Developers Association this year. The CEDA awards are designed to recognize outstanding communities in the Commonwealth for their efforts in advancing the economic viability of their community through economic and community development programs. “This is Lynchburg: Welcome Home” video project was a collaboration between the Young Professionals of Central Virginia (YPCV) and the Lynchburg Economic Development Authority (LEDA). YPCV and LEDA staff worked with Griffin Films to create a video that highlighted Lynchburg as vibrant, unique city - a perfect place for young people to live. The video, “This is Lynchburg. Welcome Home,” was launched on October 2015 via social media and email. The partnership between the YPCV and LEDA was part of a larger workforce development initiative to reach young professionals in the area through targeted marketing efforts, attract and retain new young professionals to the City of Lynchburg and help area businesses recognize and develop their own young professional networks and opportunities.